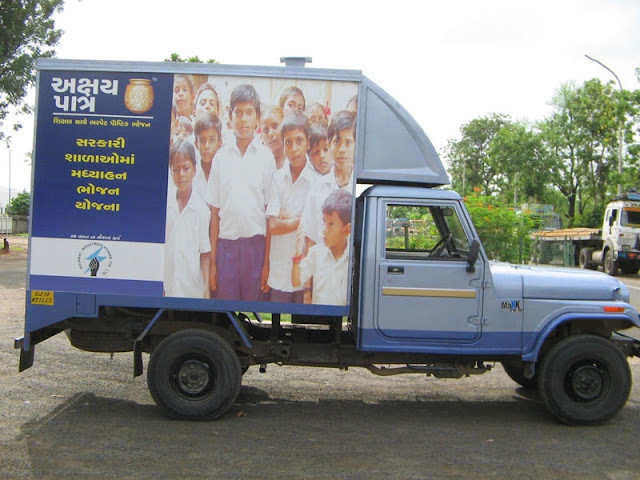 The Times Of India: The Akshaya Patra Foundation, operator of the world's largest Mid-Day Meal Programme, is driving its food truck to the residents of Bengaluru, so that citizens can taste the food and give feedback. This 'Taste of Joy' was inaugurated by the mayor, G Padmavathi on December 14 at the BBMP office, after the inauguration, the food was served to the public. The aim of this campaign was to serve a hot and nutritious Akshaya Patra meal to the people of Bengaluru. Citizens could then post their feedback on social media sites using hashtags such as #foodforeducation #zerohunger #tasteofjoy and #menuforhope. The food truck will also be going to different places across the city to increase awareness about the importance of eradicating hunger from classrooms. G Padmavathi said that the taste of the food helped in bringing students to school everyday and that the superior quality of the ingredients and the high nutritional value of the meal would help the children grow as well. Shridham Krishna Dasa, chief projects manager, The Akshaya Patra Foundation said "Over the years, both children and their parents have tasted Akshaya Patra's food. Now we are taking it to the people, whose feedback and inputs help us add more strength to children's ascent. It overwhelms me that, as the first citizen of Bengaluru, our Mayor has tasted the Akshaya Patra food and has shared good feedback. We are also glad that the 2000 people liked our food and showed their support for the noble cause by sharing their feedback." The "Taste of Joy" food truck will be going to the Nayandahalli Metro Station on December 15 at 5.00 pm.